Let us know your tips for staying organized! 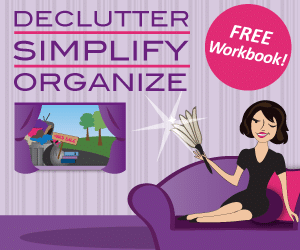 If you’ve been reading the Get Organized Wizard blog then you know how to declutter your home! But sometimes we get ahead of ourselves or forget the original goal behind our decluttering. That’s why we like to point out a few things to avoid when embarking on a decluttering project. Do you sometimes miss paying your monthly bills? Have a look at these 3 easy ways to keep these bills easily filed and accessible and most importantly, paid on time. Have you ever spend your day doing time wasting activities and then wish you could get that time back? In this post, we’ve created a list of time-wasting activities that you really need to stop doing now. One of the best things you can learn from Get Organized Wizard is you don’t have to spend too much time or money organizing your home – try these 10 tips. Building a successful business is not achieved overnight. It takes time, effort and some organizing skills. Here are 11 organizing tips to make your small business a success and as long-lasting as possible. Procrastination is completely normal but it becomes a real problem when you have no control over it. That’s why we’ve created a Master to-do list to help you feel less overwhelmed, more focused/in control, and beat procrastination once and for all. According to science, anxiety and depression may be linked to clutter. This post looks at the effects of clutter in a person’s life, how to take action to prevent anxiety, plus a free printable Stress Management To-do List. If you work from home, organizing and maximizing your home office space can make a big difference in productivity. Try our simple tips for decluttering. Once you have started it, you’ll find your flow and it’ll feel easy. Clutter leads to chaos, and it can even lead to poor eating habits. As a stay-at-home mom, whether you’re watching the kids all day or working from a home office, staying organized is key to your mental health. Let’s take a closer look at how organization impacts mental health and explore helpful tips you can follow to keep things neat and in order at the home base. Yes, it’s possible to declutter an entire house in just one month! Check out our game plan with specific tips, steps, and ideas to consider. This entry was posted in Home Organization, Other, Procrastination, Productivity and tagged organization, tips. This is some really good information about getting organized. It is good to know that you should try to develop a good budget. That does seem like a good thing to have a professional to help you figure out a workable budget.